I’m not doing a Christmas gift guide this year, but I did want to focus on a few nice things that could make a good gift. Or indeed a treat for yourself if life has put the squeeze on you. 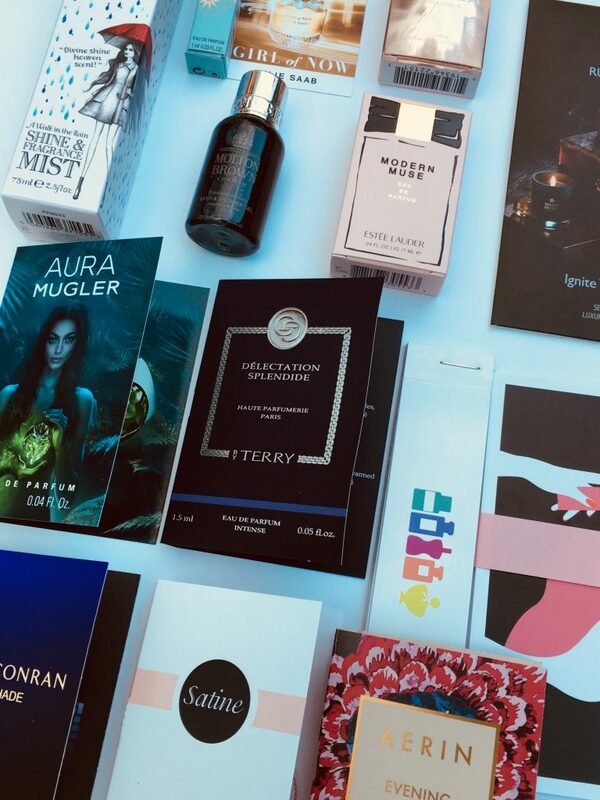 This scented beauty box hits the spot pretty well – it’s a Perfume Society Discovery Box. The Perfume Society sell a number of different boxes like this, with various options released throughout the year. You can sign up for membership, or buy boxes as a one off. They retail at under £20, and are a great way to find out if a new scent is for you before you fork out for a full bottle. The theme of this box is Fashion, Fabric & Fragrance. It’s all about how perfumers manage to capture the texture of a fabric through scent – a highly-evolved take on Does it smell nice or not? It’s a really jam-packed scent sampler box, fat with potential. There’s one full sized product, a fragranced hair mist, which covers the cost of the box. Plus you get 8 sampler perfumes ranging in size from 1 to 8ml. There’s also a mini shower gel, plus some delightful scented temporary tattoos. There’s also a set of postcards with information about each sample, plus plenty of perfume blotter strips so you can try them all at once without smelling like you’ve fallen asleep under Selfridges perfume counter. It’s a broad mix of new fragrances and I like that there are a few luxe options just for the hell of it. 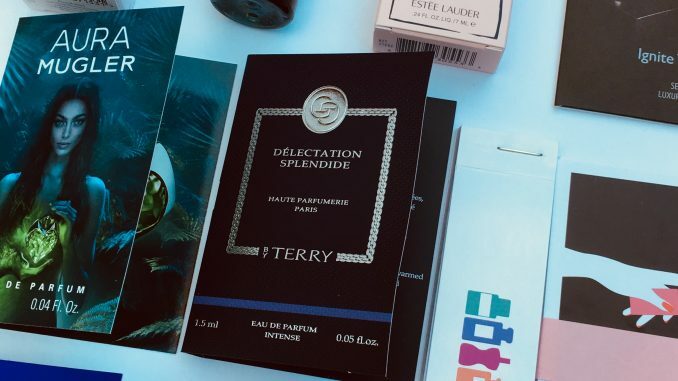 I can’t see me ever paying £175 for a perfume, but it’s good to get within sniffing distance of one with the By Terry sample. And trying out so many scents teaches you about the process, how one perfume varies from another and they all affect us differently. So you can either look on this as a lovely collection of perfumes, or an education in a box. Or both! 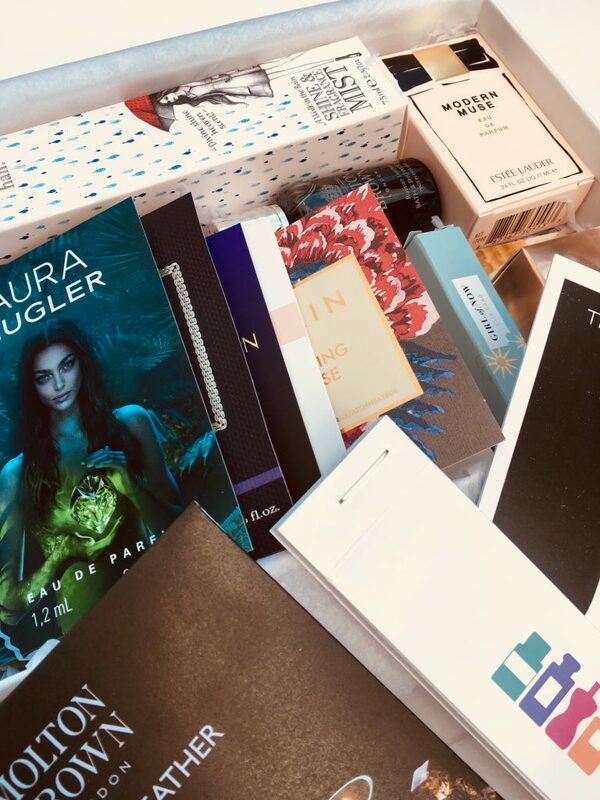 The Perfume Society Discovery Box is very nicely presented in an easy to wrap white box – as a gift for under £20 it looks impressive. With a wide age appeal, I can think of lots of people who’d be delighted to receive it. The Fashion, Fabric & Fragrance sampler box is available here. It’s £12.50 plus postage to Perfume Society VIP Subscribers, or £17.50 plus postage to non-subscribers. VIP subscription costs £25 and includes another Discovery Sampler Box, plus a range of other benefits – it might make a good gift in itself. Find out more here.